It is recommended that educator do a dry run with the data first to understand it well. It may be helpful to break the activities up with some in-class discussion instead of requiring the students to do all the activities at once. This will also likely increase student engagement in what could become a very monotonous set of assignments. The data only covers years until 2002. This can be updated by the educator by using GISS temperatures, which are available monthly. CO2 plots in the activity are a bit out of date. Using more recent data is important to address the lesser trend since the late 1990s and for discussing long-term trends vs. natural variability that can affect climate over periods of several years. Allows for comparison of several variables and time periods. Students assess climate trends on several time scales, including decadal, interannual, and seasonal. 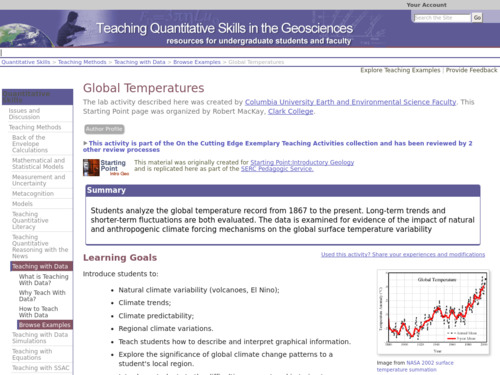 Students use real data to show long-term temperature trends based on scientific data. Strong critical thinking questions based on data and graphs. Complex, multi-step activity guides students through various types of data. Educator will need to assist students through the spreadsheet process. A guide to the data is not included, so educator needs to be comfortable and familiar with the data. Activity includes all links to data and maps.